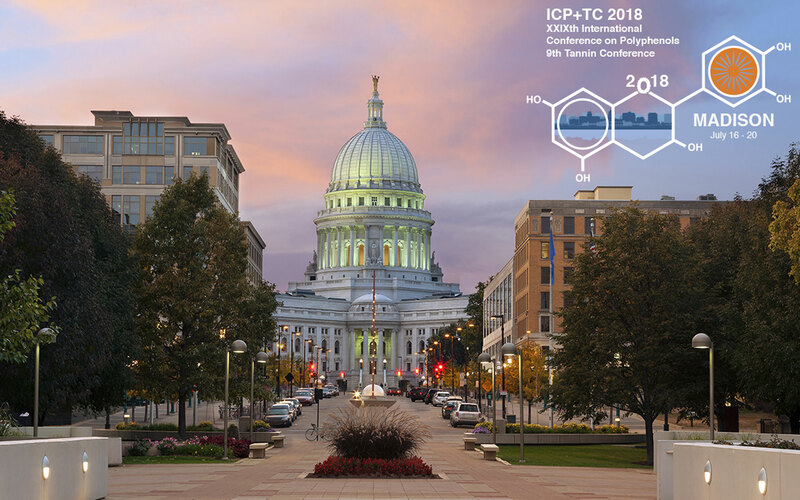 On behalf of the Groupe Polyphénols, the Local Organizing Committee invites you to Madison, Wisconsin, and the campus of the University of Wisconsin-Madison to participate in the XXIX International Conference on Polyphenols (ICP) and the 9th Tannin Conference (TC). Groupe Polyphénols, founded in 1972, is the world’s premier society of scientists in the fields of polyphenol chemistry, bioactivity, nutrition, industrial applications, synthesis, and ecology. Every 2 years, Groupe Polyphénols hosts the ICP. The XXIX ICP will be the first one to be held in the United States. In 2018, the ICP will also host the 9th Tannin Conference. After the very successful joint meeting in 2014 in Nagoya, the Tannin Conference is very pleased to continue this new tradition of meeting jointly with the ICP. It is particularly noteworthy that this conference coincides with the 30-year anniversary of the first North American Tannin Conference, held in Port Angeles Washington in August 1988. It will be great to have both the ICP and the Tannin Conference back in North America in 2018! In addition to the tannin conference sessions, the ICP will also have sessions on 1. Chemical and Physical-Chemistry, 2. Biosynthesis, Genetics and Metabolic Engineering, 3. Human and Animal Nutrition and Health, 4. Roles in Plants and Ecosystems, and 5. Applied Polyphenols. We are honored to invite you to the one of the nicest cities in the great lakes region and to one of the top ranked Universities in the USA and world. UW-Madison has a lovely campus with miles of lake front with beautiful scenery adjacent to the state capitol and many fine venues for entertainment and dining. The meeting venue, Memorial Union and Shannon Hall on Lake Mendota is a newly renovated facility, which will host the entire conference. We look forward to seeing you in Madison at the XXIX International Conference on Polyphenols and 9th Tannin Conference, July 16 to 20, 2018.